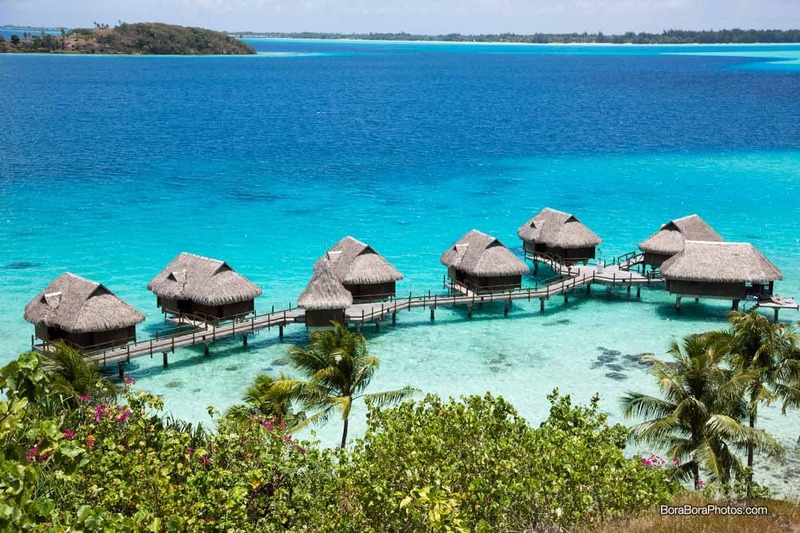 Are you planning a trip to Bora Bora or any of the other French Polynesian islands? If so, here’s a few travel recommendations on what to pack for an amazing vacation! Bora Bora is a bucketlist destination because of its beauty and tropical atmosphere. Overwater bungalows, warm lagoon water, and amazing sunsets make it easy to see why it’s also the number one place to honeymoon or anniversary. Amongst the great things about Bora Bora is that the weather is constant all year round so you should not need to overpack with too many clothes. No one wants to lug around heavy bags on whats supposed to be a relaxing trip. Bora Bora resides in the middle of the South Pacific, and while there are shops and stores on the main island there are also hefty price tags that accompany basic items. Bora Bora is the island of luxury where burgers can cost $25+ (USD) and $20+ drinks. You’ll want to bring plenty of sun screen and perhaps a bottle of liquor so that you can save money in order to buy souvineers or exotic pearls to solidify a memborable dream vacation. We have visited the island of Bora Bora four times and each time we go we use this helpful packing list to make sure we got everything covered. Paradise awaits, so let’s get packing! Here are the essential items we reccomend for a great trip. Bora Bora is a tropical island in the middle of the Pacific Ocean and due to its proximity to the equator, the sun’s rays can be very intense all year round. You’ll need to apply sun protection more frequently so bring plenty! We like Banana Boat Sport, and Neutrogena Spray because they’re both water and sweat resistant. We also bring a stronger but lighter sunscreen like this one for our faces. Don’t forget SPF chapstick and some cream like aloe vera to soothe the skin if when you get burned. Let’s face it, this tropical island has tropical bugs. You’ll want a repellent spray or wipes with DEET to protect yourself from mosquitos and other insects. You’re definitely going to explore the lagoon, so you’ll want a good mask and snorkel to see fish, coral, and sharks! Most resorts have a pair for you to check out although if you’re not up for swapping mouth pieces with all the hotel guests, then maybe you want to bring your own. There’s tons of options now with the traditional style or the all-in-one new variations, with some even having a Go Pro attachment built-in. A MUST! Not every resort has reef and sharp coral but for those that do, you’ll be glad you have some protection for your feet. From personal experience Jason stepped on a sea urchin and had a little spike stuck in my foot for months until it finally came. Not fun, so bring water shoes! I’m loving these colorful jelly sandals by the way. Plan on sitting in the sun and reading a book?, or maybe you just want to look cute. Either way a nice big brim hat or cotton beach hat can provide shade and keep your face turning red if you forget to keep apply your sunscreen. I also like this fedora and fun trucker hat. Don’t forget to pack sunglasses, a week of squinting with all that sunshine will leave you with a bunch of wrinkles around your eyes, no one wants that. Even a cheap pair of sunglasses is a good idea to have on your packing list. When you’re not jumping off your overwater bungalow into the Bora Bora lagoon, maybe you just want to float around on top of it and enjoy where you are. If that sounds like a plan, then perhaps you should bring a cheap plastic raft. There’s the always favorite tube-style design, or maybe you’re more into laying on mattress-shaped one. 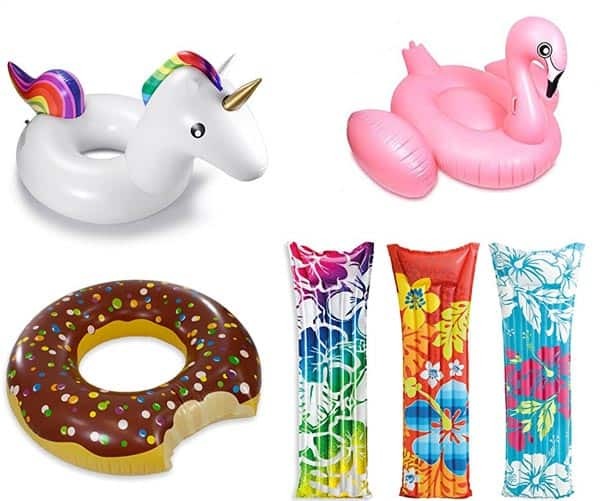 Although if you want to be the queen of the lagoon then I suggest a huge flamingo or unicorn raft. Better to be safe than sorry, accidents even if minor can happen. Supplies and medicine can be hard to find on the island, and the prices at the drugstore in Vaitape can set you back a pretty penny just for some antacids. It’s a good idea to pack away a small first aid kit and hope that you don’t need to use it. Keep hydrated, that intense sun will have you sweatin good. Some of the resorts will have water dispensers at breakfast or in the gym for you to fill up a reusable water bottle. You can save money doing that instead paying outrageous prices for water at the hotel store. The power outlets in Bora Bora use the two round peg configuration. There’s usually one American-style outlet in the bathroom but just pick up one or two universal power adaptors and you should be good. The huge blue lagoon in Bora Bora is what draws people to this incredible destination. Water is everywhere and there’s some amazing things to be seen below the surface so it’s a good idea to have an underwater camera to capture those moments. I recommend bringing a Go Pro if you want to shoot video. If you’re not brave enough to test the waterproof capabilities of your new phone then may I suggest this. If you plan on leaving your resort to explore the island via an excursion or just plain huffing it by foot. Get a light day bag or collapsible cooler so you can picnic anywhere you want. We suggest bringing a few drinks and snacks and spending a few hours at Matira Beach. When that sun goes down, things get pretty dark. Yes the hotels do a nice job of uplighting palm trees, but if you’re walking around an unfamiliar place it’s a good idea to pack a small flashlight. There’s not very many streetlights and sidewalks on the island so a flashlight can help oncoming cars see you better. Most of the fun activities on Bora Bora happen during the day and in the water. Depending on your budget and length of stay we recommend at least 2 or 3 excursions to get a feel for the island. Once those are done, you’ll want to have some downtime activities pass the time. An adult coloring book, deck of cards, and a few good books on my Kindle Fire are essential for a relaxing vacation. Depending on the weather you might experience a tropical shower or two during your visit. Due to the tropical climate the rain can come and go pretty fast so that shouldn’t deter you from seeing the sights of the island or making the trek from your overwater bungalow to the resort restaurant. Stuff a light rain jacket in your bag incase you need to use it. A typical flight from Los Angeles, CA to French Polynesia is around 8 hours. If you’re taking a red-eye flight and you want to get some decent sleep, then get yourself a good neck pillow so that you’re rested and ready to go when you arrive. And for complete comfort one of these and one of these would be real nice too. Yes, you’re probably paying a large sum to visit, but don’t forget to pack a good attitude. Tourism is the primary industry in Bora Bora. As you can imagine thousands of people per year visit this tiny island and yet there are only a handful of resorts. The island lifestyle is slower paced, but the locals and resort staff will do their best to accommodate all your needs. Be gracious and treat them with respect and they will go out of there way to take care of you. Please note we do make a small commission from each affiliate link listed here, but we want you to know that we stand behind the products we recommend. Previous articleWhen to go to Bora Bora? Yup! There are lots of bugs in Bora Bora, I have listed mosquito repellent under the First Aid section. DON’T take packed meat, it’s forbiden by customs and you will probably loose it, they are very strict, same goes for alcool. The environment in Tahiti is special and should be protected. However we have brought packaged canned tuna (always in its original container and sealed) without problems. Never bring home cooked meals. Upon arrival if you are unsure, visit the Biosécurité (Customs) desk who will check and either approve or not its import. Regarding Alcohol we usually pick up a bottle of rum at the Duty Free shop at the airport before our flight. This just might be our experience but Customs has never had a problem with us bringing alcohol into Tahiti. We are heading to Bora Bora in November. Since that is their summer season, do you recommend taking a light rain jacket? Hello Denise, yes I would advise bringing a rain jacket if you are visiting during the summer months. Make sure to make a copy of your passport. Comes in handy if you loose your passport.